Britford Marine is a Nigerian Marine company established in 1995. The company is a subsidiary of OCO Group of Companies, Plot 77C OCO Drive, Trans- Amadi Industrial Layout, Port Harcourt, Nigeria. Britford operates in the Marine Electronics and Electrical sector providing economical and reliable services with efficient service delivery. With our own well equipped workshop, training facilities, trained Engineers (expatriates and national) and affiliation to leading partners who are the established names in the field, Britford has the capability to provide a total solution on marine electronics problems to vessels, platforms and coastal establishments operating in the oil rich Nigerian and African water. OCO is the Authorized representative of L-3 Communications Klein Associates, Inc. in Nigeria. Britford do services on request for international service agents like Radio Holland, A-N-D, Telemar and Mackay Marine and we undertake sales, leasing and after sales services for the following products Raytheon, Furuno, SEA Intl, Sailor, JRC, ICom, Jotron, Phonetec and Trico. Britford is a single window absolute and integrated electronics solution for Ship yards, Ship owners, Ports, Platform Coast Guard, and Offshore construction vessels. 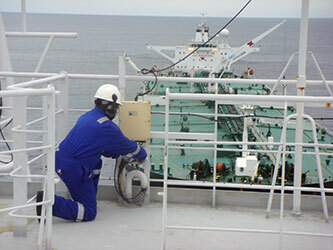 All products are compliant to IMO/IEC and SOLAS Carriage. Internal Communication Equipment Sound Power Telephone, Talk back system, Intercom Telephones, PA system and integrated communication system. Tracking Systems - Integrated Coastal and Harbour Surveillance system. The mission of the system is to provide a full situational awareness of the coverage area. The surveillance sensors are Radars, AIS, thermal cameras and LRAD (Long range aquatic Devices). The sensors do detection, monitoring and classification of all cooperative and non-co-operative targets and alarms are produced if the dangerous target enters the guard zone. The collected data is processed by the specially designed radar processors that use MS Windows and are customer tailored. The real time situation is connected from the processor to the digital displays in the control room via LAN. The antenna RPM of the surveillance and small target detection Radar is 40-80 RPM thus the detection of targets as small as a swimmer or small boat is also done.